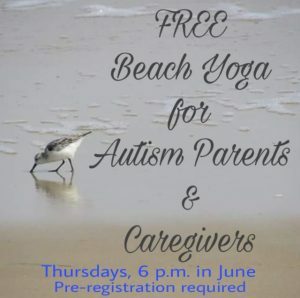 Beginning June 2017, we will offer a free beach yoga class to autism parents and caregivers every Thursday 6-7 p.m. at 5th Street East, Folly Beach, SC. The class is open-level and is taught by autism parents (also RYT-200 certified yoga teachers). Pre-registration is required. Contact us to pre-register.